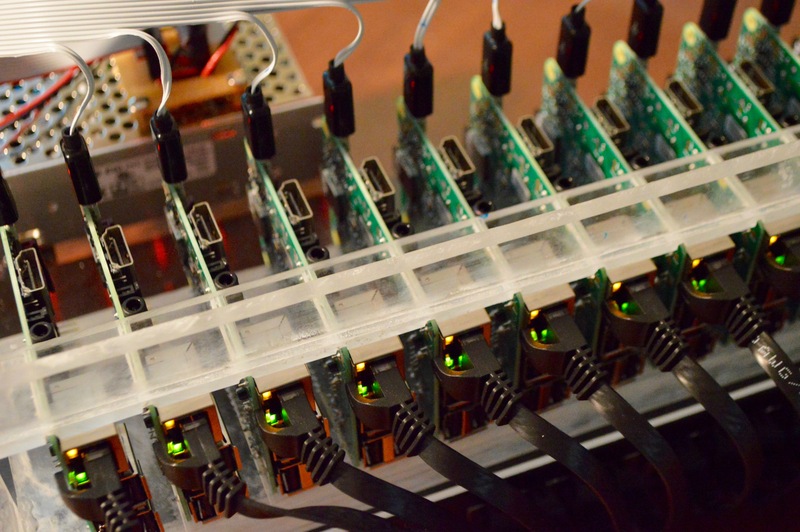 There has been a little bit of a fad recently of building networked clusters of Raspberry PIs and other SBCs. Some large ones to use as beowulf clusters for research. Some for automated testing. And some people using them as a low cost scaleable web serving platform. I got inspired to build my own with the goal of having a build that is compact, inexpensive and reasonably attractive. 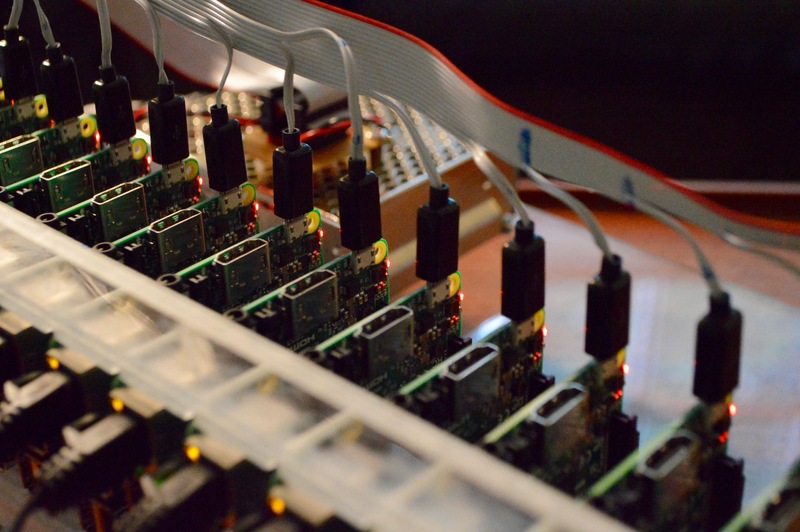 I think it compares well to a lot of Pi clusters I’ve seen online. One of the keys to making it compact is to not have each board separated into a separate physical container. 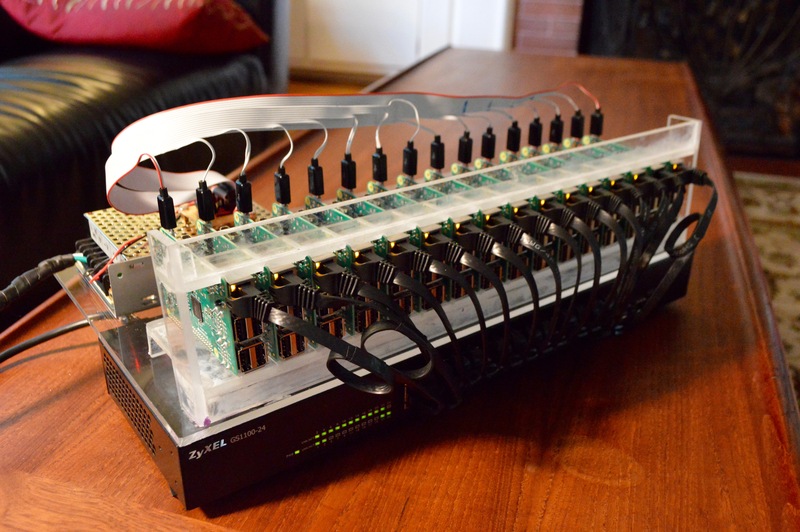 The PI Pi Dramble is an example of a build that uses a stacking case. 16 nodes would require a few of those towers. In my build I have a frame that I made from a $20 acrylic sheet. Each board slides into a grooved holder about 2.5 cm between each board, just enough to clear the height of the USB sockets – the widest part of the board. The other key element of this build is a compact power distribution system. 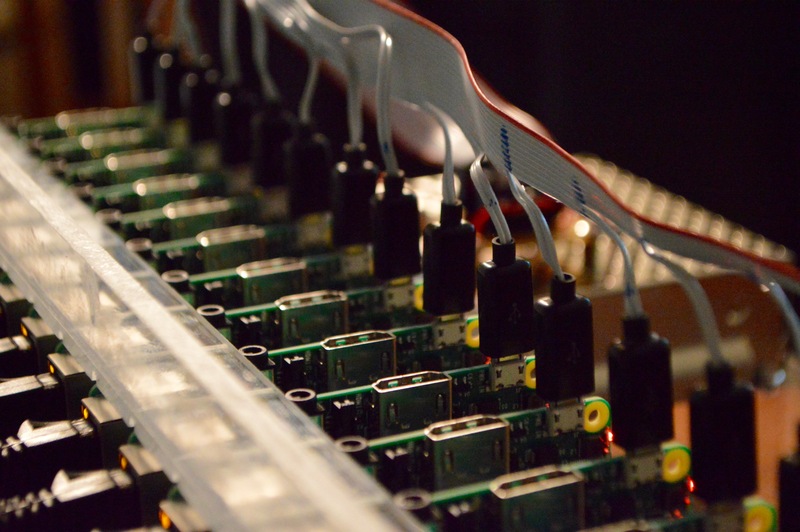 Most of the builds use collections of powered USB hubs, and separate USB cables to each board. In my build I made my own power wiring harness from ribbon cable and connected it directly to a 100 watt, 5 volt power supply. On top of the power supply, on little standoff is a small board that distributes power. Every other wire is +5v and a matching return. The ribbon cable ends in a standard 16 pin SDI connector. Then each pair of wires is soldered to a micro USB connector. 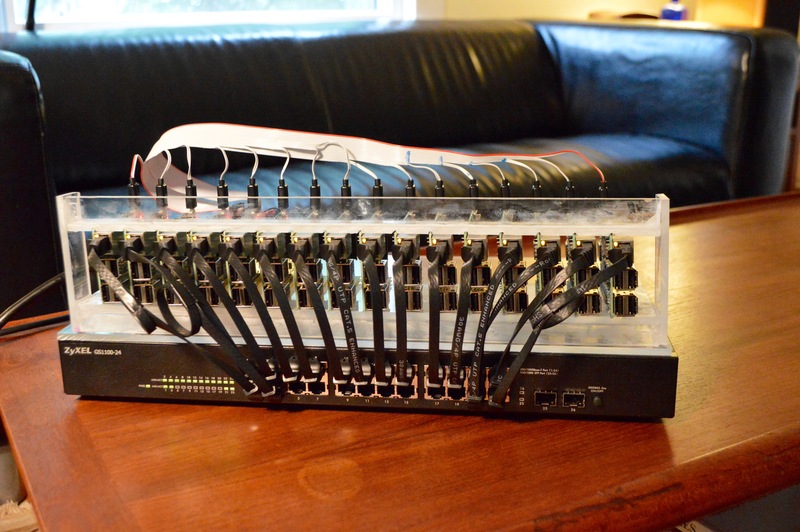 Another element that makes this build compact is to stack it right on top of a rack mountable switch, and connect the Pis to the switch using very short 6 inch flat cat5 cables. For three pf the boards that are on the edges I had to use a slightly longer 12 inch cable.